Ca'Pietra Tiles. Argento Travertine Honed and Filled Stone Floor and Wall tiles. 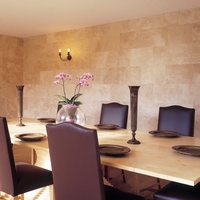 A really versatile travertine with soft, neutral colouring that means it works with almost any style and colour scheme. Suitable for use either as a floor or wall tile and for both classic and modern environments.